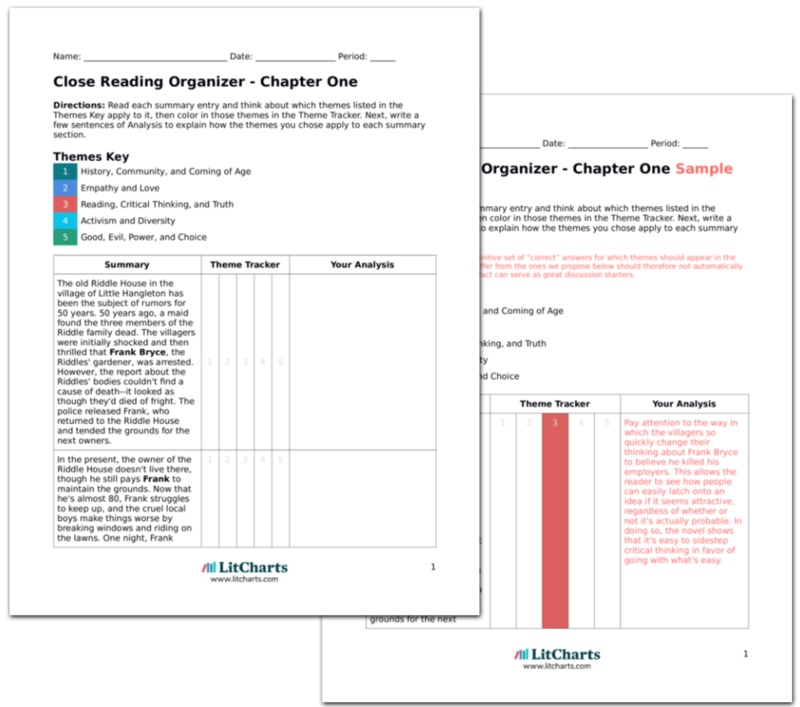 Instant downloads of all 945 LitChart PDFs (including Harry Potter and the Goblet of Fire). 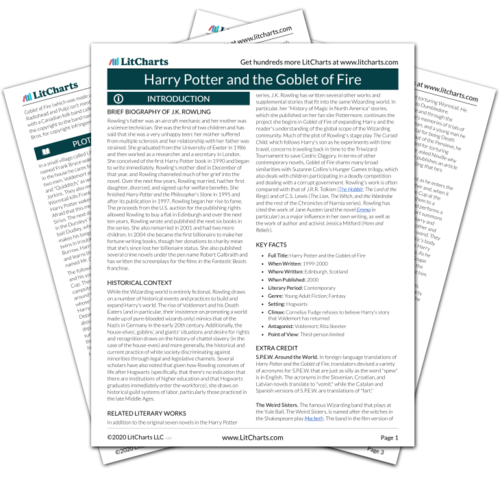 Welcome to the LitCharts study guide on J.K. Rowling's Harry Potter and the Goblet of Fire. Created by the original team behind SparkNotes, LitCharts are the world's best literature guides. A concise biography of J.K. Rowling plus historical and literary context for Harry Potter and the Goblet of Fire. A quick-reference summary: Harry Potter and the Goblet of Fire on a single page. In-depth summary and analysis of every chapter of Harry Potter and the Goblet of Fire. Visual theme-tracking, too. Explanations, analysis, and visualizations of Harry Potter and the Goblet of Fire's themes. Harry Potter and the Goblet of Fire's important quotes, sortable by theme, character, or chapter. Description, analysis, and timelines for Harry Potter and the Goblet of Fire's characters. Explanations of Harry Potter and the Goblet of Fire's symbols, and tracking of where they appear. An interactive data visualization of Harry Potter and the Goblet of Fire's plot and themes. Rowling's father was an aircraft mechanic and her mother was a science technician. She was the first of two children and has said that she was a very unhappy teen: her mother suffered from multiple sclerosis and her relationship with her father was strained. She graduated from the University of Exeter in 1986 and then worked as a researcher and a secretary in London. She conceived of the first Harry Potter book in 1990 and began to write immediately. Rowling's mother died in December of that year, and Rowling channeled much of her grief into the novel. Over the next few years, Rowling married, had her first daughter, divorced, and signed up for welfare benefits. She finished Harry Potter and the Philosopher's Stone in 1995 and after its publication in 1997, Rowling began her rise to fame. The proceeds from the U.S. auction for the publishing rights allowed Rowling to buy a flat in Edinburgh and over the next ten years, Rowling wrote and published the next six books in the series. She also remarried in 2001 and had two more children. In 2004 she became the first billionaire to make her fortune writing books, though her donations to charity mean that she's since lost her billionaire status. She also published several crime novels under the pen name Robert Galbraith and has written the screenplays for the films in the Fantastic Beasts franchise. 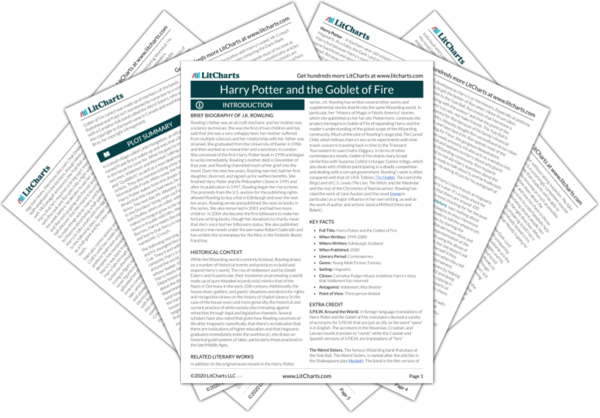 Get the entire Harry Potter and the Goblet of Fire LitChart as a printable PDF. While the Wizarding world is entirely fictional, Rowling draws on a number of historical events and practices to build and expand Harry's world. The rise of Voldemort and his Death Eaters (and in particular, their insistence on promoting a world made up of pure-blooded wizards only) mimics that of the Nazis in Germany in the early 20th century. Additionally, the house-elves’, goblins’, and giants' situations and desire for rights and recognition draws on the history of chattel slavery (in the case of the house-eves) and more generally, the historical and current practice of white society discriminating against minorities through legal and legislative channels. Several scholars have also noted that given how Rowling conceives of life after Hogwarts (specifically, that there's no indication that there are institutions of higher education and that Hogwarts graduates immediately enter the workforce), she draws on historical guild systems of labor, particularly those practiced in the late Middle Ages. In addition to the original seven novels in the Harry Potter series, J.K. Rowling has written several other works and supplemental stories that fit into the same Wizarding world. In particular, her "History of Magic in North America" stories, which she published on her fan site Pottermore, continues the project she begins in Goblet of Fire of expanding Harry and the reader's understanding of the global scope of the Wizarding community. Much of the plot of Rowling's stage play The Cursed Child, which follows Harry's son as he experiments with time travel, concerns traveling back in time to the Triwizard Tournament to save Cedric Diggory. In terms of other contemporary novels, Goblet of Fire shares many broad similarities with Suzanne Collins's Hunger Games trilogy, which also deals with children participating in a deadly competition and dealing with a corrupt government. Rowling's work is often compared with that of J.R.R. Tolkien (The Hobbit; The Lord of the Rings) and of C.S. Lewis (The Lion, The Witch, and the Wardrobe and the rest of the Chronicles of Narnia series). Rowling has cited the work of Jane Austen (and the novel Emma in particular) as a major influence in her own writing, as well as the work of author and activist Jessica Mitford (Hons and Rebels). S.P.E.W. Around the World. In foreign-language translations of Harry Potter and the Goblet of Fire, translators devised a variety of acronyms for S.P.E.W. that are just as silly as the word "spew" is in English. The acronyms in the Slovenian, Croatian, and Latvian novels translate to "vomit," while the Catalan and Spanish versions of S.P.E.W. are translations of "fart." The Weird Sisters. The famous Wizarding band that plays at the Yule Ball, The Weird Sisters, is named after the witches in the Shakespeare play Macbeth. The band in the film version of Goblet of Fire (which was made up of members of the bands Radiohead and Pulp) isn't mentioned by name due to a conflict with a Canadian folk band called the Wyrd Sisters, who owned the copyright to the band name in Canada and sued Warner Bros. for copyright infringement. Brock, Zoë. "Harry Potter and the Goblet of Fire." LitCharts. LitCharts LLC, 21 Mar 2019. Web. 23 Apr 2019. Brock, Zoë. "Harry Potter and the Goblet of Fire." LitCharts LLC, March 21, 2019. Retrieved April 23, 2019. https://www.litcharts.com/lit/harry-potter-and-the-goblet-of-fire.